The 26.34 metre motor yacht Camy has been sold with Michael Wan at Neo Yachting in Singapore acting for the buyer and seller. Built in GRP by Italian yard Dalla Pieta, Camy was delivered in 2006 as an 80HT model and partially refitted in 2013. Accommodation is for eight guests in four cabins consisting of a full-beam master suite, VIP suite and two twins, all with entertainment centres, Sony LCD television screens and en-suite bathroom facilities. There is also accommodation for four crew in two en-suite twin cabins. The capacious open-plan saloon comfortably seats 14 guests who can relax on cream leather settees and armchairs in front of an entertainment centre including a 42-inch Sony LCD television screen with a drink from the wet bar alongside. A sliding sun roof brings a breath of fresh air and daylight in. The aft cockpit encompasses a massive lounging area on sun pads and also comes with a table and four chairs for al fresco dining. Under the sun pads on the foredeck is a garage storing a tender, Jet Ski and a retractable davit, included in the asking price. 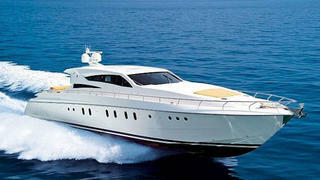 Twin 2,000hp MTU diesel engines give her a cruising speed of 30 knots topping out at 36 knots. Lying in Singapore, Camy was asking €888,000.